Caption slip reads: "Photographer: Glickman. Date: 1957-07-03. Assignment: New police communications room for Valley division. 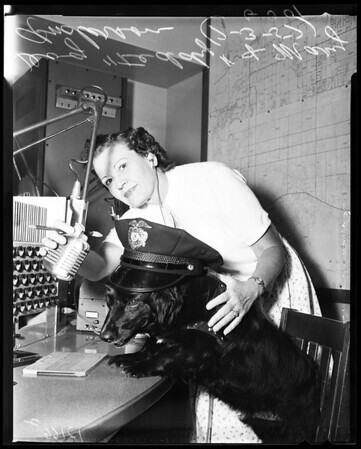 G300-301: 'Teddy' press room mascot at the Van Nuys police station has the honor of barking first call over new police radio system serving the San Fernando Valley. With him is the regular radio dispatcher, Mary Anderson."